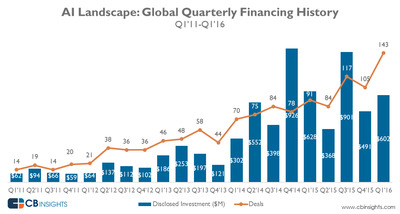 Investors backed more AI companies in the first quarter of 2016 (Q1’16) than in any other quarter, according to research from venture capital analysis firm CB Insights. In Q1’16, there were over 140 deals to startups focused on AI, CB Insights data wrote on its blog on Tuesday. Data startup Trifacta, DNA testing startup Pathway Genomics, and cognitive computing business Digital Reasoning Systems were among the AI-powered companies that raised equity funding rounds in Q1 from investors including Goldman Sachs, Accel Partners, Greylock Partners, and the IBM Watson Group. 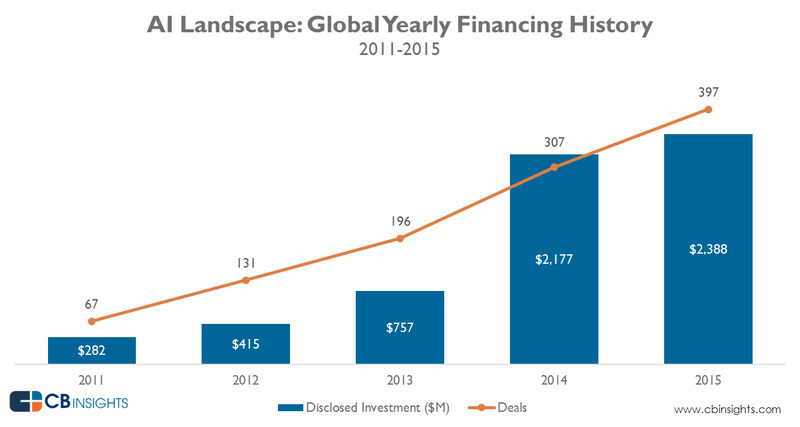 So far in 2016, more than 200 AI-focused companies have collectively raised nearly $1.5 billion (£1 billion). 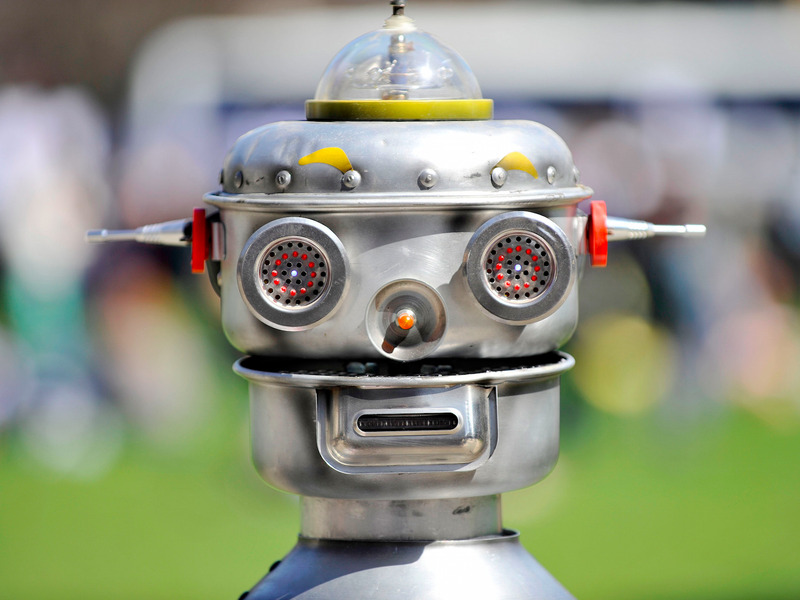 The pick up in AI funding activity comes as businesses look to make their platforms and systems more human-like. Corporates use AI to provide customer support via a chatbot, or to help busy executives manage their personal diaries. 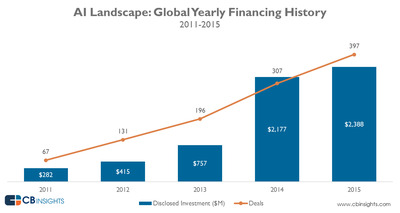 Equity deals to AI startups — including those applying AI technology to healthcare, advertising, and finance, as well as those developing general-purpose AI tech — increased from roughly 70 in 2011 to nearly 400 in 2015 and 2016 is set to be a new record. CB Insights found that the vast majority of AI deals are made at the early stage, with just over 20 companies raising series D funds or beyond in the last five years. 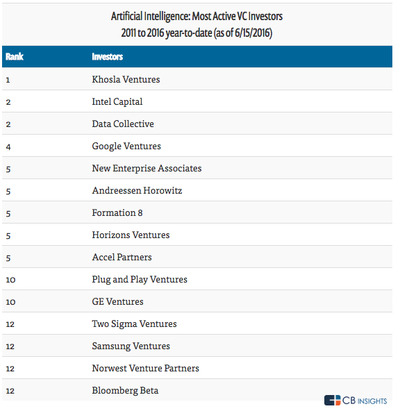 Khosala Ventures was deemed to be the most active AI investor between 2011 and 2016, having backed over 15 companies during that time frame, including Atomwise, which uses deep learning to discover new medicines, and MetaMind (recently acquired by Salesforce), which powers business applications with AI. 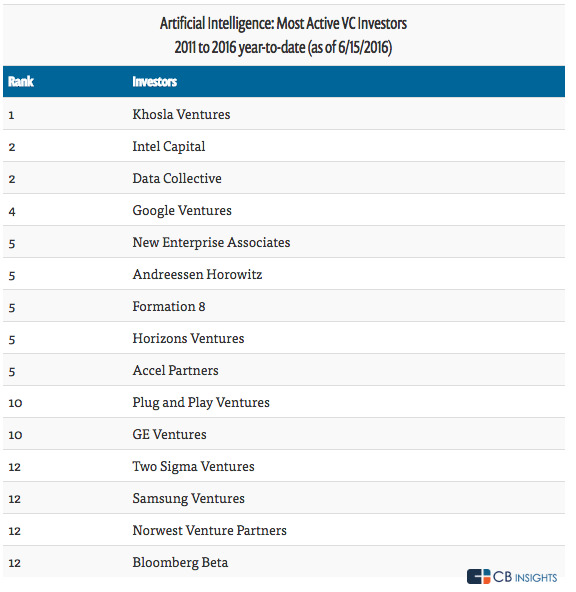 Google Ventures, Andreessen Horowitz, and Accel also feature in the top 10 most active investors. While some AI startups are choosing to raise money and go it alone, there are others that are allowing themselves to be acquired by Silicon Valley heavyweights. In the UK, DeepMind, a company building general-purpose AI technology, was acquired by Google for a reported £400 million, while Magic Pony Technology was acquired earlier this week by Twitter for a reported $150 million (£102 million).